Mark this one down in the “You have got to be kidding me” category. So apparently, the NCAA had to issue proposal 2011-78. 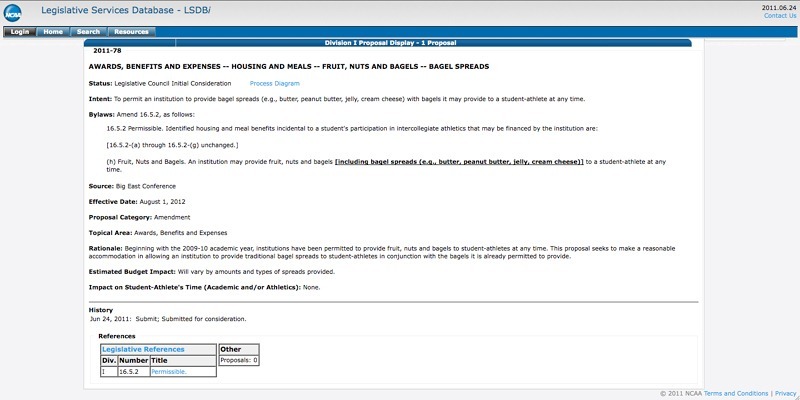 2011-78 permits an institution “to provide bagel spreads (e.g., butter, peanut butter, jelly, cream cheese) with bagels it may provide to a student-athlete at any time.” Apparently, bagels were already legit … so this is just about the spreads. No word on where a college can procure such bread holes from legit bakeries. I doubt it! But in the meantime, every single student-athlete in the Georgia area should contact their athletic department and request visits from Atlanta’s original bagel fairy! Come to think of it – I’m gonna go grab me one of them there BB’s out of my bagel bag! It helps to have a delivery girl who is also a foodie!